The battle for Pompey’s left-wing berth has got plenty of the Fratton faithful enthused. Andre Green made a goalscoring return from injury in Tuesday’s Checkatrade Trophy victory over Tottenham under-21s and is now determined to win a regular starting spot in Kenny Jackett’s side. David Wheeler in action against Spurs under-21s. Picture: Robin Jones/Digital South. The wide man was accompanied on his Fratton Park arrival by rave reviews, with a host of Aston Villa fans frustrated he was allowed to depart the Championship outfit on a season-long loan in August. Yet the England under-20 international has the mammoth challenge of usurping Ronan Curtis on the left flank. The charismatic Irishman has made a scintillating start to his Blues career since arriving from Derry City, scoring six goals and creating seven. Certainly the competition will bring out the best out in the pair, which will only boost Pompey’s chances of promotion from League One. The right wing has also been key for the table-toppers this term, with Jamal Lowe acting as one of the Blues’ chief attacking outlets. The former non-league ace continues his upward trajectory and currently tops the club’s scoring charts with seven goals to his name. But Lowe will and should be taking frequent glances over his shoulder to ensure he retains his Pompey starting place. David Wheeler’s spell at Fratton Park hasn’t worked out the way he’d have liked so far. For the most past, the QPR loanee has been confined to the substitutes’ bench, forced to watch Lowe torment opposition rearguards. Wheeler has featured in just 10 matches this campaign. What’s more, only three of those have been starts – and not one has been in the league. To his credit, an ankle injury picked up in October impeded his progress, after eye-catching substitute appearances against Shrewsbury and Gillingham. Nevertheless, Wheeler has displayed his capabilities of late and his confidence will be burgeoning. He came off the bench to head home the Blues’ final goal in their 4-0 FA Cup first-round victory at Maidenhead. Although it was a close-range finish, the former Staines Town ace swiftly reacted to Lee Brown’s saved free-kick and deftly steered a diving header home. Wheeler was then handed a start against Spurs on Tuesday, keen to make a statement to his manager. And he did exactly that under the Fratton Park lights, with his drive down the right flank, deliveries into the box and creativity earning him The News’ man-of-the-match award. 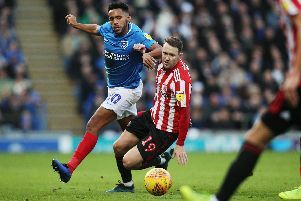 After a discouraging season at QPR last term, the Brighton-born ace moved to Fratton Park looking to get his career back on track. Although he still faces a tough task to dislodge Lowe, he’s endeavouring to clinch the right-wing spot. And with a hectic run of games approaching, Jackett will no doubt utilise the man who netted 20 goals for Exeter during the 2016-17 season more frequently.